Of all the fields that IoT could be applied in, the one that has received the most attention and hype is how it will enable the concept of a “smart city”. Smart cities are those that leverage ICT systems to enable “smarter” decisions and more efficient processes in the management of community assets. The IoT greatly expands the capability to bring this “intelligence” to a broader range of assets that previously were not digitized. Cities often have multiple but disconnected smart programs around topics such as transport, energy use, air quality and so forth. However, the aspiration of the smart cities concept is to address complex issues that cross multiple functional areas to drive better outcomes such as the livability, sustainability and economic viability of our urban environments. Virtually every aspect of the operation of urban environments is amenable to IoT applications – from the work of councils to the operation of city wide water/waste infrastructure, from major community assets like hospitals through to local community initiatives, from regional transport planning to the sharing economy, there is no end to the potential range of ideas. Many of the major industry verticals such as utilities, transport and healthcare all converge in cities, making them a fertile ground for IoT. However, the challenge for the smart city concept is finding consensus across cities to accelerate IoT market development not in terms of vertical sectors but in a multi-disciplinary approach, starting from policy, regulations, designers, engineers and operators. Smart cities are a scale-neutral and a geography-neutral idea. They can be scaled up from a plaza, a park, and a street, all the way up to a region or a nation in any part of the world. A key concept underpinning smart cities is the idea of “open data”. The idea is that government provide data that its sensors deliver free of charge to anyone in the community that may want to create new “smarter” services around that. To that extend, smart cities encourage and empower its citizens to drive the innovation agenda. An example of this is when Transport for NSW release rail, ferry and bus information to companies wishing to create their own apps around public transport. In smart cities, the smart component (technology and data) should not take precedence over the sustainability, liveability and workability of a city, but work to enhance them. The concept of a smart city has evolved from a top down technology-driven approach which did not take into account how city systems worked; through technology-enabled outcome-driven change; to a collaborative approach between developers, residents and governments which goes beyond the idea of smart cities as the end pipe of siloed smart solutions to parking or lighting. As well as a global appetite to embrace technology to improve the experience of our cities, another major driver of the global smart cities agenda is reducing the carbon footprint. The construction sector has lagged behind agriculture and manufacturing in adopting disruptive IoT technologies to improve energy efficiency and reduce emissions. There are also opportunities to make better use of enabling technologies such as building information systems and building management systems to drive change in Australia. With such a complicated landscape, a key issue for IoT and Smart cities is common standards. Governmental organisations don’t want to be locked into vendor solutions. Also they’ve got a lot of legacy systems. So a big challenge for city authorities is how to invest and which standards to uphold. 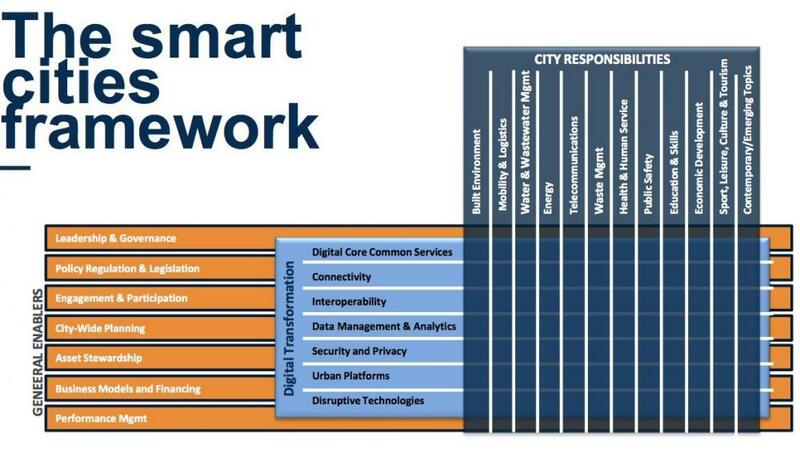 A key standards initiative in the smart city space is called the HyperCat. This is a specification that allows IoT clients to discover information about IoT assets over the web. With Hypercat, developers can write applications that will work across servers, breaking down the walls between vertical silos. 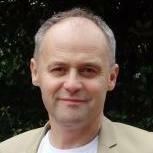 A group called Hypercat Australia has been formed to support the roll out of the specification in Australia. Another supporting initiative is the PAS 212:2016 standard which provides for an automatic resource discovery for the IoT. On the global stage, standards for smart cities have been around for some years. Smart Cities Council has compiled some of the most common smart cities standards worldwide in a Smart Cities Guidance Note published in mid-2017. In 2013, the Smart Cities Council developed the Smart Cities Readiness Guide as a resource for governments around the world working to develop smart cities. The diagram below shows a framework from this guide which identifies the responsibilities of local authorities in delivering services and infrastructure (dark blue), the general roles that enable them to carry out their responsibilities (orange). The light blue horizontal section of the diagram above shows the digital transformation technologies that will provide the smart city’s ‘smarts’, including data management and analytics. Australian investment in infrastructure, and alignment in local, state and federal funding for smart cities are also providing conditions for successful development of smart cities. The Australian Government has developed a “Smart Cities Plan”. This includes a program for funding smart city initiatives. There are also other government reports and strategies supporting the development of smart cities in Australia (see Further Reading at the end of this page for links to more information). There are a number of associations specializing in this area including the Australian Smart Communities Association. Other nations, including New Zealand, Canada, Dubai, India and the US have also launched initiatives within the global smart cities agenda.